The Miami South Beach nightlife scene is famous worldwide. It is a sun-drenched expanse of land great for sight-seeing. During the day, you only get to see the part of the beach that is less noisy with just the stretch of sand, cafes, parks and the beach volleyball. The night brings the art deco neon, flashy cars, rhythmic music, glammed up club-goers, and bars and night clubs of all kinds. At South Beach, you will definitely notice Ocean Drive. It is the major thoroughfare in South Beach. The road starts at South Pointe about a quarter mile west of the Atlantic Ocean. It continues to 15th street and immediately southeast of Lincoln Road, which hosts a pedestrian mall filled with restaurants, shops galleries and different businesses. Ocean Drive is popular for its Art Deco hotels and hot spots such as the famous Colony hotel and the Carlyle hotel. 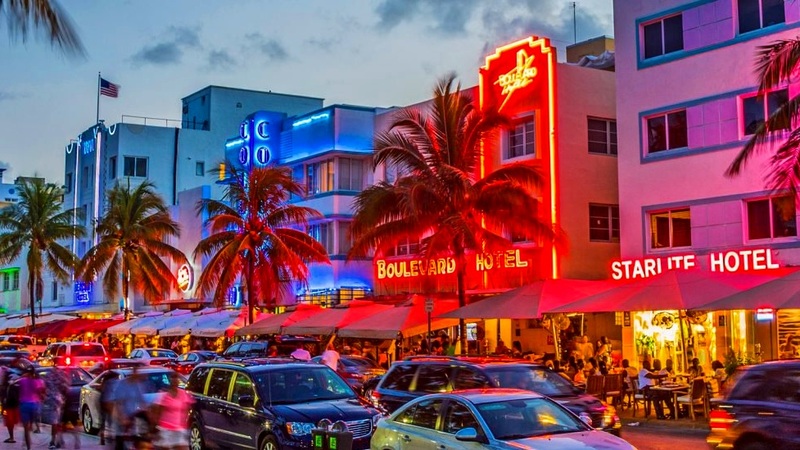 These Art Deco buildings and the array of neon lights define the Miami South Beach. The neon lights are on every corner of the South Beach; the buildings are lighted in neon lights of different colors and creates a gorgeous backdrop against our fabulous sunsets. Wynwood Walls has been ranked the number 4 out of 12 things you should do in Miami, more reason why your guests should go there. It was launched during Art Basel in 2009 and has turned into the City’s only outdoor street art park. It features more than 40 murals contributed by different artists and muralists. Wynwood Walls colorful murals are one of the top instagrammable spots in Miami. It is the largest and oldest zoological garden in the state of Florida, formerly named Miami Metro Zoo. See tons of amazing wildlife in large, natural-inspired open habitats. This is a great destination for kids as well as adults. Zoo Miami has plenty of places to rest, restaurants and places for snacks, and lots of great spots to take amazing selfies for your guests to commemorate their Miami destination wedding trip! And of course the most important part of Miami is the beach! You can’t miss Miami Beach on your trip. From the iconic art deco painted lifeguard towers to the miles of white sand, crystal clear blue green water, and blue skies, your guests will be thrilled that you chose Miami for your destination wedding!